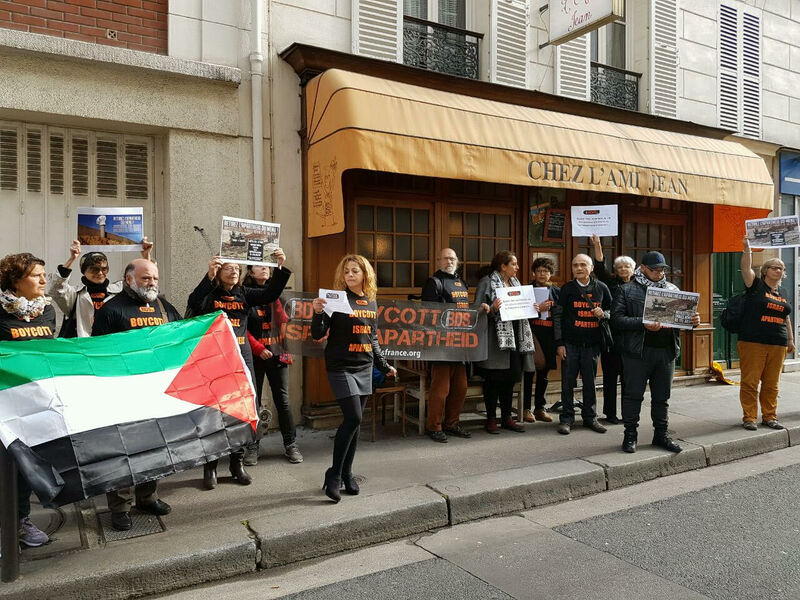 Human rights activists opposed to Israel’s regime of occupation and apartheid have picketed the Musket Room in New York, L´ami Jean in Paris and the Maruja Limón in Vigo, as well as restaurants in other cities, in protest of their participation in a culinary event in Tel Aviv which intends to whitewash Israel’s violent repression of Palestinian human rights. Dubbed by its Israeli organizers as an offensive of “gastro-diplomacy”, the Round Tables tour, taking place from November 6 to 26, brings chefs from 13 international restaurants for an Israeli-government sponsored cook-in in Tel Aviv. The Spanish government, which on paper opposes illegal Israeli settlements, is putting its name to the event alongside Golan Heights Winery, a business profiting from Israel’s occupation and annexation of the Golan Heights. “Israeli ministries have for years been involved in the “Brand Israel” project, aimed at using culture and the arts as a way of distracting from its horrendous human rights record in order to create a positive image,” said the letter. Signatories pointed at the “appalling use of the time-honored tradition of sharing culinary experiences as a means for whitewashing widespread violation of Palestinian fundamental rights” and called on the chefs to cancel their participation. Israeli activists supporters of Palestinian human rights created a parody video that satirically demonstrates this blatant whitewashing. The event pioneered by American Express will serve Golan Heights wine with the gourmet meals prepared by the international chefs. They will be staying at Dan Hotels, which has a settlement hotel built on stolen Palestinian land in occupied East Jerusalem. The so-called Tel Aviv “liberal bubble”, where the chefs will be cooking their expensive meals, is made possible only through Israel’s apartheid wall, checkpoints and the ghettoization of Palestinians, including the medieval siege of over 2 million Palestinians in Gaza, that keeps the daily brutality of the occupation out of sight. The manager of one of the restaurants picketed told local activists that they were not informed of the Israeli government involvement and the political nature of the event or that it was protested last year saying the restaurant would not have participated had they known. Although it was too late to pull out, the restaurant was aggrieved that the organizers of Round Tables did not disclose this information when they were invited to participate. Upon learning of this complicity they informed activists that they would not participate in the future. “The Israeli Government benefits from the international reputation of these chefs to cover up the brutality of its regime. It is using their art and reputation to mask its crimes,” explained Liliana Córdova, a Madrid-based activist picketing the restaurant. Campaigners in Denmark wrote to Oxfam IBIS as the charity is collaborating on a development project with chef Claus Meyer and restaurant Gustu in Bolivia, two of the participants in Round Tables. Oxfam has consistently spoken out against illegal Israeli settlements and their devastating impact on the food security of Palestinian families. Meanwhile Italian activists appealed to sparkling water brand Ferrarelle to withdraw their sponsorship of the event. Last week citizens took on social media in response to a Palestinian call for action using the hashtag #apartheidRoundTables. Over 480 twitter posts appealed to the 13 participating restaurants and their chefs to cancel their presence and hundreds of comments were left on their Facebook pages. Activists who vocally protested the event last year have vowed to continue until the event is cancelled appealing to chefs considering their participation in future editions to refuse the invitations. The event has gathered significant bad publicity in the local and international press for the participating restaurants.